The Walt Disney Co. wants to use interactive projector technology to turn its hotel rooms into a new fully-immersed environment. It’s an amped-up evolution of the company’s already popular projector night lights on the consumer market today. The company last month was issued a patent, dubbed Image Projecting Light Bulb, that could be used in hotel and household light sources like desk lamps or ceiling fixtures to project animated images into a desk, bed or walls. It could be used to turn a regular hotel room into a scene from a game or movie that children can play in, patent documents showed. For instance, right now if one plays a car racing game on a computer, they not only drive the cars, they also hear them, hear other cars, hear the crowd, see fiery crashes, hear the explosions, and the game play is back-grounded by emotional music and the like. If they play with a slot car, they only get to drive a car. There are few sounds, certainly no background music to amp up the emotions. When they play on a screen, the world is completely surrounding and immersive, they only have to move by brain through the frame of the screen bezel and they are into another world. If they play in their room, none of this is true. The goal of the projector with its camera and audio attachments of the display systems described herein is to allow a room, where ever the room is located, to become as immersive as any screen environment or even more so. To this end, the display system is a device that can be both an input and an output device. On the output side, the display system is a projector of still or animated visual imagery, and the display system may include a speaker or otherwise be capable of sending audio signals to speakers elsewhere in the room. In this way, the display system may provide an audio track to projected imagery to enhance the display and/or gaming experience. Images in patent documents showed the system could be designed to work with everyday electronics like tablets and smartphones or even a radio-frequency-enabled book that could communicate with the projectors and further enhance the interactivity between the guest and the room. In addition, the projector’s fixtures could be implemented with touch interfaces that “may become the source for many kinds of interactive play, essentially making sections of rooms, whole rooms, and other spaces into interactive video spaces that surround and immerse users in stories and games (e.g., a video game leaps off of a flat display screen into the player’s room or play space),” patent documents said. Disney’s existing projector night lights on the market work more like the classic View Master toys, where preset image cartridges are slid into the projector and they display still frames. This new patent seems to be looking to turn the walls of a room into a moving screen, like a storybook being enhanced by the projector displaying moving scenery, lights or sounds similar to what’s happening in the book. The patent also looks at including a tracking camera that can be programmed to remember a user’s facial features and then change the imagery to that person’s settings — or in another case can be used to wake up a child by projecting images onto their bed. 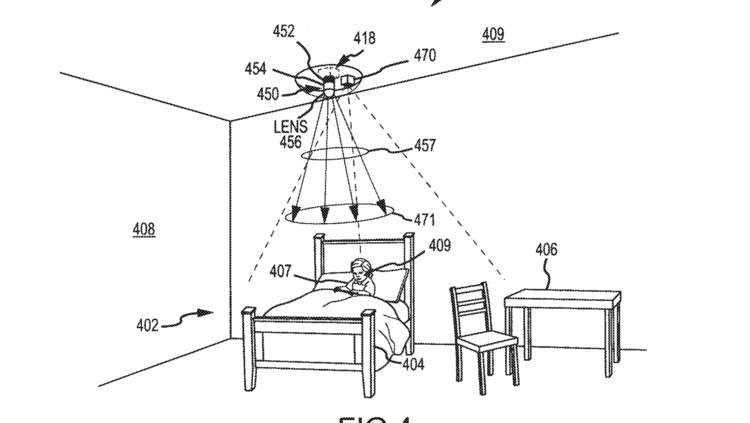 Disney in patent documents said the technology could be used in the amusement park setting or in a hotel lobby, but many of the descriptions are for inside the hotel room or in private homes.